Before I talk about the benefits of wordsearches, let’s acknowledge the haters. Wordsearches get a bad rap. There’s a lot to hate about wordsearches. They look a lot like busywork. They look really low level. They look like everything wrong with a worksheet culture. They look ridiculous next to advanced products and activities. They can be frustrating, especially for students with a learning difference. I’m the first to admit, they’re not for everything (but what single technique is?). 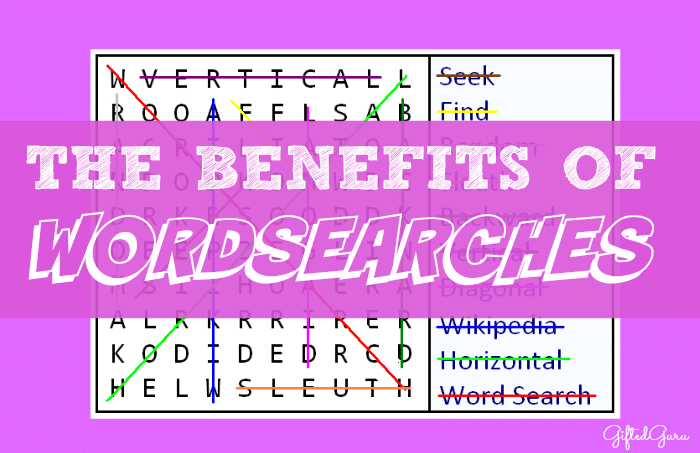 I’m going to share the benefits of wordsearches, and why I think you just may get converted! What looks obvious to an adult (find this word in a sea of words) is far more complicated to an emerging reader who is learning to tell the difference between a word that begins g-r-e-a- and a word that begins g-r-e-e.
They’re a beginning, in other words. There are several kinds of context clues that build fluency, some of which can be developed in wordsearches. Semantic or Meaning Clues – When you read about cars, you expect to find words like road, steer, tire and windshield. Picture Clues – Images can give us clues to words and their meanings. Teachers can create wordsearches that have pictures for clues, rather than the words themselves. This is especially effective if they are kept in families. For example, a science teacher could have pictures of types of cloud formations as clues, with the students searching for nimbus, etc. in the puzzle. While they are searching, they have the word and its image in their minds. Ah, the letter Q actually is followed by a U. I know because I searched for all of those Q words, and they all had a U after them as well. Oh! And T often has an H after it. And words that end with -a-m-e all rhyme! This organic discovery of patterns, in combination with other strategies of course, is one step towards fluency. Academic vocabulary is a key to mastery of any discipline. Scholars know the vocabulary of their discipline, and the first step towards vocabulary is exposure to the word itself. You can use wordsearches to do this, and you can use wordsearches for a self-test review. I see and find the word, and I highlight it if I can’t define or use it. Some of us are natural born spellers (Oh, how I love me a spelling bee), while others of us recite little ditties to remember the order of letters. We’ve all seen the failings of spellcheck, and there is no ideal substitute for actually knowing how to spell. People with dyslexia understand the struggle this presents in everyday life, and would not dismiss it as simplistic or useless. It’s easy to take lightly what comes easily. Wordsearches can help students learn the basics of spelling by seeing the same word in the context of its word family. A lot of us actually like completing word searches. Don’t believe me? Check out the magazine section of your local store. You’ll see that people actually pay cold, hard cash for books of wordsearches. It’s true. They can be created around student interest, making them one of the most simple ways to differentiate for student interest in the known universe. They work great for those small moments of time because they can be stopped and started easily, unlike some activities. Teachers can raise the thinking level of wordsearches in a couple of ways. Have students create them by evaluating a text and having them create a wordsearch of a certain set of words (most important, inferential, adjectives, figurative language, adverbs, prepositions, descriptive, etc.). Students can complete the wordsearch and then create words out of the remaining letters. Give a wordsearch with no word bank and ask students to search for as many words as they can find related to a topic or story. When I started my Teachers Pay Teachers store (you can read about that decision here), I decided that I was going to only put in quality things I could stand behind. I decided that both wordsearches and crossword puzzles would have a place in the store for all of the reasons I listed above. Are they perfect for everyone all of the time? Absolutely not. Are there other strategies that do all of these things? Yes. Is there a place for them in the classroom? In many cases, I believe they do. It’s become common in contemporary pedagogy to dismiss certain things (wordsearches, posters, etc.) out of hand. That’s throwing the baby out with the bath water. 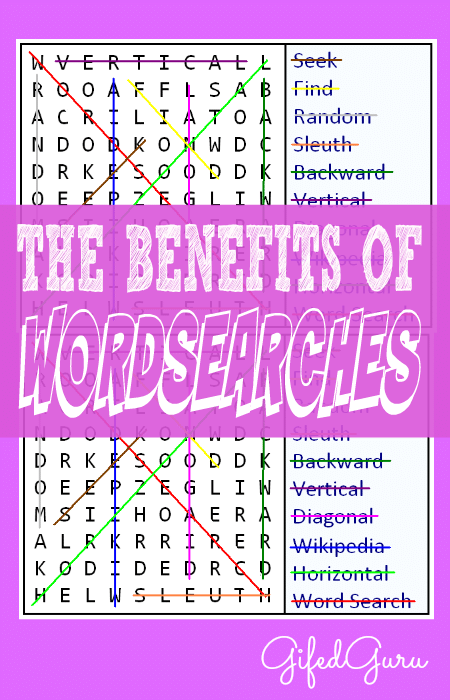 Virtually any technique can be made to be awesome in the right hands, and wordsearches are no different. If you’re interested in mine, you can find one on math vocabulary for 4th grade here. Thanks, Kirsten! I fixed it, and I appreciate it very much!!! Thank you. Very enlightening and helpful Lisa. My daughter has ADHD and wordsearches are very frustrating for her. She has a difficult time finishing them in the allotted time. She then has to spend every lunch finishing them at the “silent” table. Lunch is 20 minutes. I’m sure your suggestion will be to speak with the teacher but I have and it does little good. That’s actually not my suggestion. My suggestion would be to have your daughter develop some techniques to help her with these. Perhaps a rule or piece of paper to cover up the rows she’s not looking at. Whether it’s this or any other activity at school, developing strategies is key. Also, rather than finishing them at lunch, perhaps they can be finished at home. One other option is to ask for them to be printed on yellow paper – it’s easier to see. I teach Adult ESL Literacy learners and had a learner exhibit a significant amount of frustration while doing a word search. I will have him use a ruler or another piece of paper the next time we do one. Thank you so much for these strategies. Strategies are exactly what I want to provide for my learners. They have a big job learning to be students/learners in a classroom setting and mastering English! I want to help not have them feeling defeated! Are the word searches with the spelling words spelled incorrectly several times in the search valuable in learning to spell the week’s words? I don’t really see how that would help. It would run the risk of having them learn the words incorrectly by repeating the phonological loop of the incorrect spelling. Thanks Lisa—my thought exactly! By the way, grades are taken on these word searches—what do you think about that? I actually do these for fun. I was just curious about the various benefits of them. Thanks!